American Marathon US Olympic Team leaders Ryan Hall and Deena Kastor both saw racing action at the BolderBoulder 10K race in Colordao yesterday, but neither was a factor in the professional races there. Both are still said to be recovering from their respective races at London and Boston last month. Ridouane Harroufi of Morocco won the men’s race in 28:32. Jorge Torres was the first American finisher (29:59) with Ryan Hall finishing in 14th place in 30:07. In the women’s race, the Ethiopian women controlled the race in the early stages, but Millicent Gathoni of Kenya came from behind to win in 32:49. 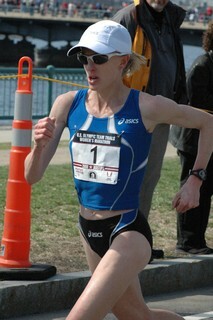 Deena Kastor looked strong in the first few miles of the race, but she faded and finished well back in 7th place in 33:44. Kenya’s Gathoni gave high praise to Kastor after the race telling the Associated Press: “I ran out of fear of Deena Kastor. I was afraid of Deena Kastor. I kept thinking she would come back at me, but she never did.” That kind of fear in her competitors tells us how deep the respect for her runs in the elite field.